This adorable idea featured on bhg.com is an affordable and memorable party favor. 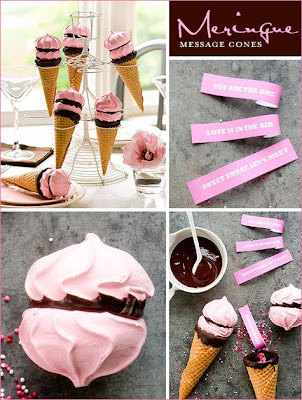 Originally featured as a Valentine's concept and inspired by fortune cookies, this versatile treat can be used at any occasion by changing the color of the meringue and the messages inside. All you need are some sugar cones, meringue cookies and chocolate chips. Melt the chocolate chips and use as a sugar "glue" to place the "ice cream scoop" on top. For the message inside you can add candies, quotes or even turn it into a game with questions about the guest of honor. Sky is the limit with this show stopping party treat! Credit (photo) is also due to the insanely cute hostess blog.